VOA doesn’t want to be cool, or trendy. The collaborative project wishes to write “good music” for music’s sake. Every note of every work is examined through the lens of “is this what will make the song the best version of itself”. It is a study of the pop rock genre, a conscious effort at creating self-supporting works of musical magic. Glistening guitar tones over a driving foundation are at the heart of the VOA sound. 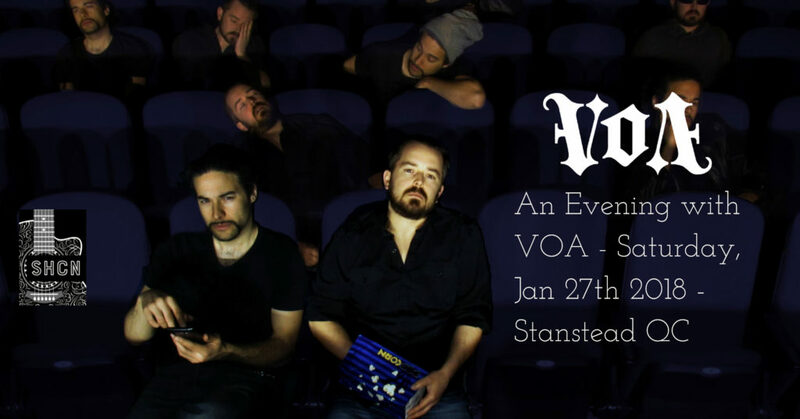 Since the founding members of VOA are established pillars of their local music scene, regal rock is the term used to describe the musical origins of the project. Music for movies is what they produce: deep imagery to be paired with amazing images. JF Coley, a fifth-generation musician, songwriter, arranger and producer, has been active in the Canadian music scene since 2002, as a member of Flicker, Coley, and now VOA. A multi-instrumentalist JF‘s demos for an upcoming Coley album are what started VOA. and producer, was a member of Coley in 2006. He has also played in DelaVoy, Union of Slaves and Fable; as well as performed in a variety of other musical projects. Without Pascal there is no VOA. Potluck vegetarian dinner at 6 pm. Concert goes at 7.30 pm. $20 at the door.